Volunteers participate in Hackney’s rough sleeping streetcount. Photograph: Hackney Council. This year’s rise in people sleeping rough in Hackney has been called out by a leading councillor as “an outrage”. Hackney’s figures, which are put together as an estimate informed by a snapshot street count conducted over a single night last year, have gone up from 18 people in 2017 to 23 in 2018. The news comes against a background of London seeing the largest increase in England in rough sleeping for the year along with the West Midlands, with the capital’s rate rising 13 per cent since 2017. Cllr Rebecca Rennison, cabinet member for finance and housing needs said: “It is an outrage that in the 21st century we still have people sleeping rough on the street. 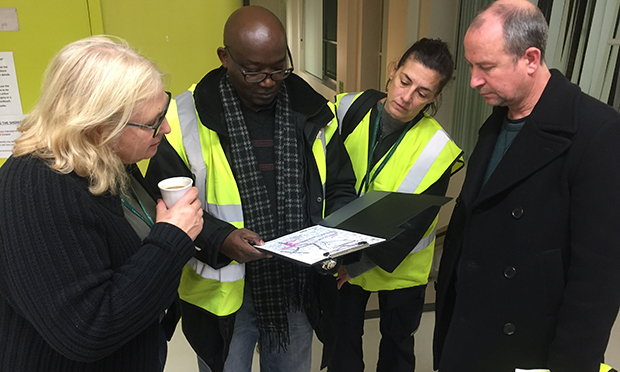 “We are determined to do all we can to end rough sleeping in Hackney, through prevention work, hostel beds, a rough sleeper pathway, as well as The Greenhouse, which offers ongoing support and advice to anyone who needs it. “However, we cannot do this on our own; this is a national problem which requires national solutions. The Town Hall collect the figures in an annual count conducted with partner homelessness organisations. The council’s dedicated homelessness strategy aims to reduce rough sleeping in the borough to zero. In London, a shocking rise in rough sleeping over the past decade is shown by an increase from 415 people counted in 2010 to 1,283 last year. For more information on how to help rough sleepers, visit Streetlink.org.uk.